This post is in continuation to the previous post that talked out the OSB installation and setup of Dev environment in Eclipse IDE. 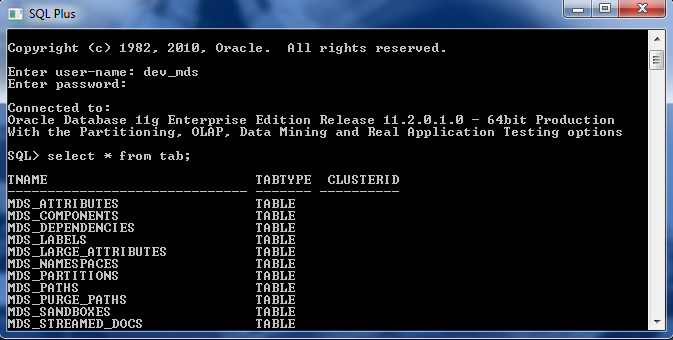 In this post, we will see the database dependency of OSB. OSB Reporting functionality which is provided as one of the service monitoring features, needs database tables to store reporting data. By default, derby internal database is used for this purpose or we can configure to use any other schema during WLS domain creation. 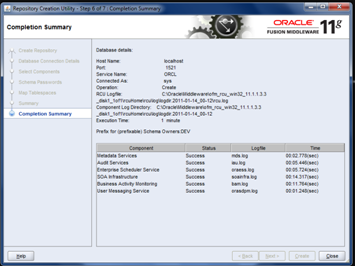 And one of the major features included in OSB11g is integration with the Oracle Web Services Manager (OWSM). OWSM provides policy based security solution to secure the proxy services. 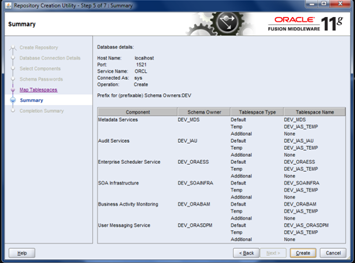 These out of the box OWSM policies are provided in the metadata store (MDS) that requires a database. Refer to this link for more information on OWSM and FAQs at this link. 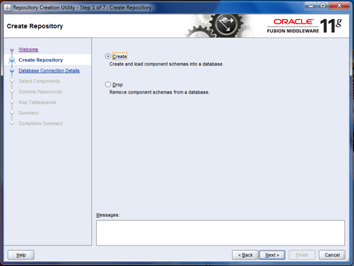 These required schemas can be installed into database using repository creation utility provided by oracle. Since we are using OSB11g (11.1.1.3) download the RCU 11.1.1.3.3 from think link. Different schemas that can be created using RCU can be found here. Since we are planning to use OWSM with our OSB installation, we will see how to install this MDS using RCU. 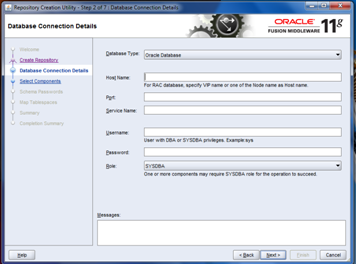 If we want to use Oracle XE as a database, then we should update the database parameters once after the installation. Set the processes parameter to >=200 using the following instructions. Unzip the downloaded RCU zip file to any folder in the file system and call this as $RCUHOME. Run the file $RCUHOME/rcuHome/rcu.bat that brings up the below screen with options Create and Drop. We can use same utility to drop the existing schemas as well. Click on Next to bring up the next screen and give the installed database details. Click on Next. At this stage the database compatibility check will happen and the following error will be shown if the database is incompatible. 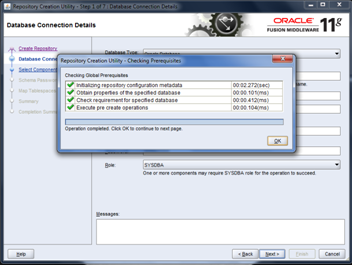 As we can the database version should be equal to or higher than 10.2.0.4.0 in 10g or 11.1.0.7.0 in 11g. If the compatibility check is successful, we will get the following screen with successful message after checking the prerequisites. Click OK on check prerequisites and proceed to next screen where different schema components can be selected. Give the new prefix as DEV (or some other value you are comfortable with) and select metadata services if we just want OWSM. 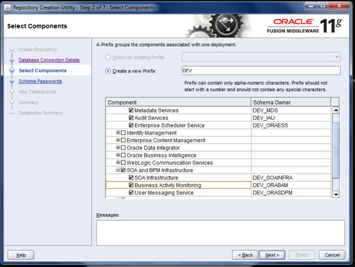 And select SOA Infrastructure component if you are planning to install SOA Suite as well. So select all these and observe the schema owner column. Click Next and click on OK, once another prerequisites step is also over. Proceed to the next screen where we can mention the password for each schema that we want to create. 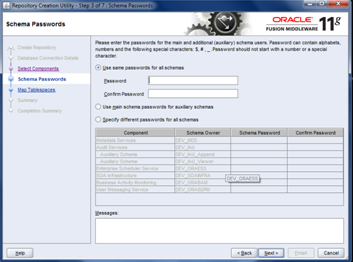 Based on preference, we can give the same password to all the schemas or different password for each different schema. Click on Next and where we can create the required tablespaces for all the schemas that we selected including default and temporary table spaces. 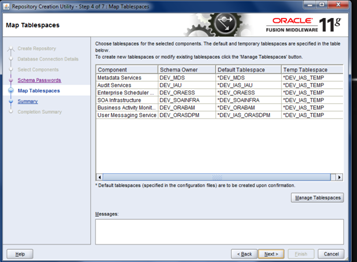 We can click on Manage tablespaces if we want to modify any of the default properties. Click on Next and click on OK in the popup that comes up to create all the tablesapces as mentioned in the previous step. Click on Create in this screen to create all the table spaces. Once everything is successfully completed, we can see the following screen with completion details. To verify the successful schema installation, we can go to sql plus screen and login with the respective schema user name and password. For example, the following screen shows the login is successful to DEV_MDS schema and also able to see all the tables.